Este templo, obra del Ingeniero Russel P.Cook, es un extraordinario ejemplo de la arquitectura neogótica. Cabe destacar el magnífico trabajo de cantería en sus muros almohadillados, la carpintería del cancel de la ventana con un hermoso vitral, su puerta y la torre en aguja. 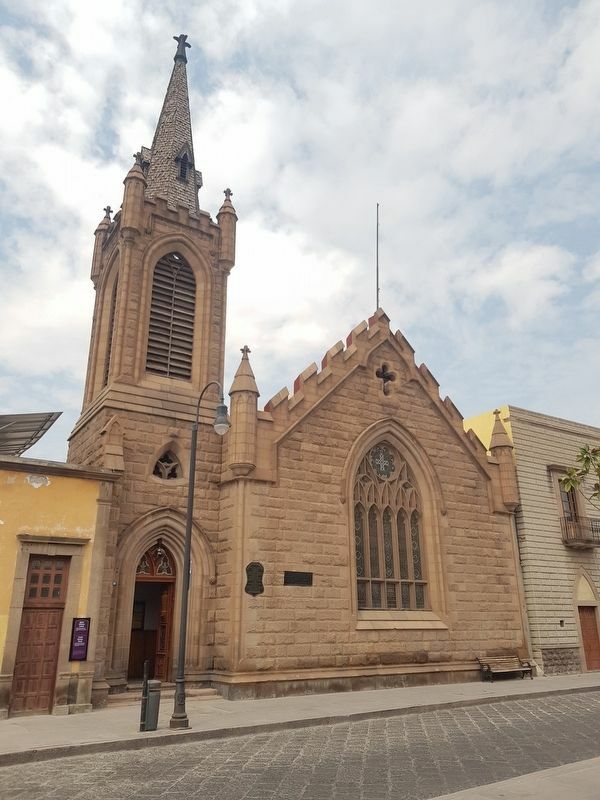 Se abrió al culto en 1900. This temple, a project of engineer Russell P.Cook, is an extraordinary example of neo-gothic architecture. Especially notable are the magnificent stonemasonry of its cushioned walls, the carpentry of the windowsill with its beautiful stained-glass window, its door and the steeple tower. It was opened to worship in 1900. Location. 22° 8.955′ N, 100° 58.75′ W. Marker is in San Luis Potosí, San Luis Potosí, in Municipality of San Luis Potosí. Marker is on Calle Independencia just south of Vicente Guerrero, on the right when traveling south. Touch for map. Marker is in this post office area: San Luis Potosí 78000, Mexico. Touch for directions. 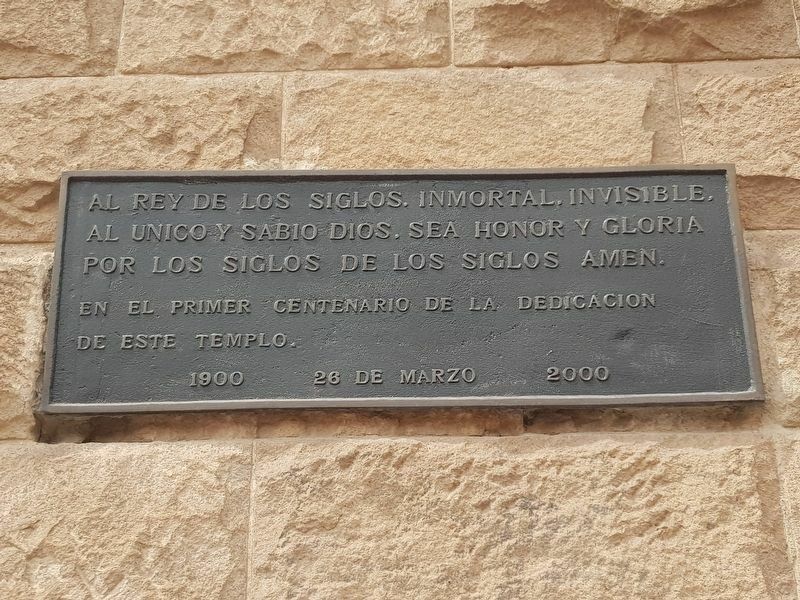 Al Rey de los Siglos, inmortal, invisible, al único y sabio Dios, sea honor y gloria por los siglos de los siglos Amen. 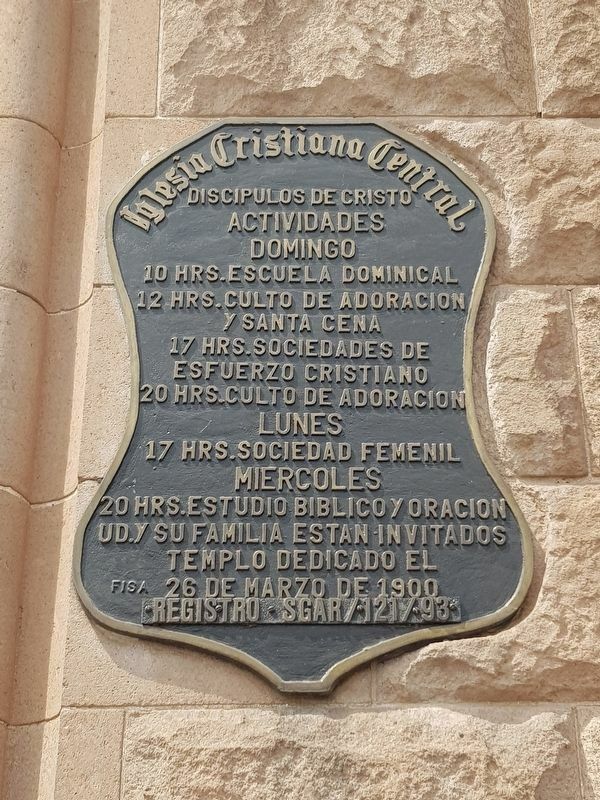 En el primer centenario de la dedicación de este templo. (about 180 meters away, measured in a direct line); Guerrero Garden (about 180 meters away); Our Lady of Remedies Temple / The Third Order Temple / San Francisco Temple (about 180 meters away); Temple and Ex-Convent of San Francisco (about 180 meters away); El Camino Real de Tierra Adentro (about 210 meters away); Monument to Vicente Guerrero (about 210 meters away); The Plan of San Luis (approx. 0.3 kilometers away). 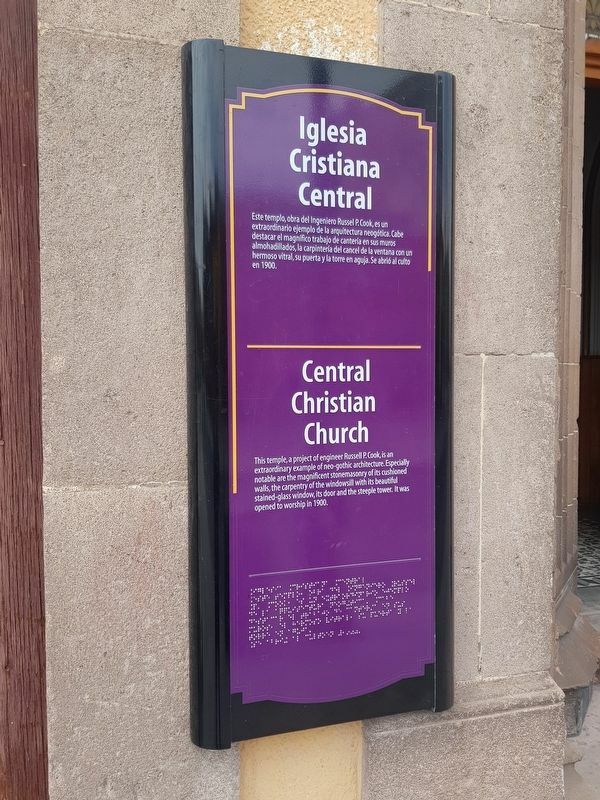 Touch for a list and map of all markers in San Luis Potosí. More. Search the internet for Central Christian Church. Credits. This page was last revised on April 16, 2019. 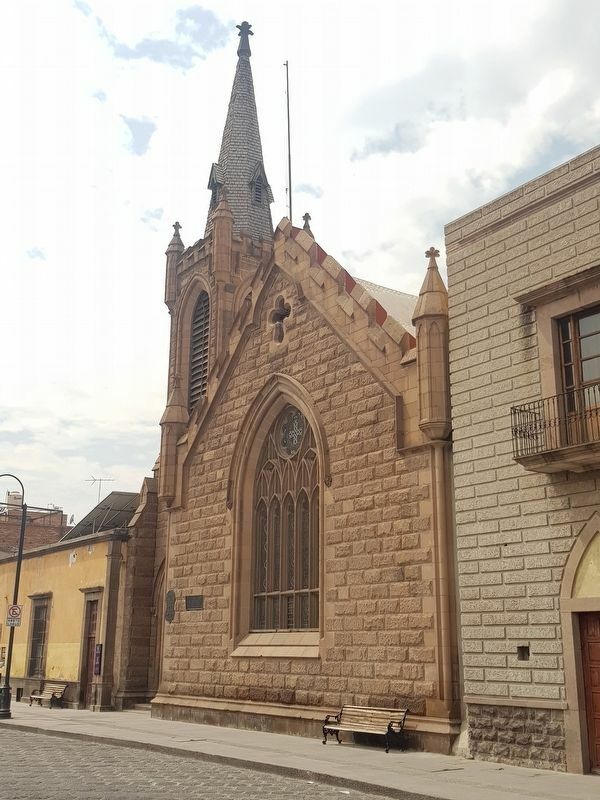 This page originally submitted on April 16, 2019, by J. Makali Bruton of Querétaro, Mexico. This page has been viewed 17 times since then. Photos: 1, 2, 3, 4, 5. submitted on April 16, 2019, by J. Makali Bruton of Querétaro, Mexico.